Development aid by itself cannot ‘save the planet’. Yet, development aid and institutions have the potential to remain important catalytic actors in achieving developmental and global environmental objectives. Developing countries must be crucial players in successful climate change mitigation as they are responsible for 88% of the growth in greenhouse gas (GHG) emissions since 1970. However, the current aid architecture — which was designed in the 1970s when environmental issues were a distant concern — is not well suited to support environmental challenges that extend beyond low-income countries. There is an overlap between traditional development and environmental challenges. Countries with low adaptive capacity are especially vulnerable to climate change impacts. Developing countries are crucial players in successful climate change mitigation as they are responsible for 88% of the growth in greenhouse gas (GHG) emissions since 1970. Despite debate on the role of aid in improving people’s economic and social wellbeing, recent research shows that aid has a significantly positive long-run impact on development. The fact that a third of the absolute poor live today in middle-income countries suggests that there is still ample need for aid to promote poverty reduction, even in those countries which have graduated from low-income status. The remaining low-income countries are likely to be more difficult cases where reliance on traditional development recipes may not be sufficient. Poor countries highly sensitive to the effects of environmental challenges, and due to their relatively low ability to adapt to these changes, are likely to be particularly vulnerable. 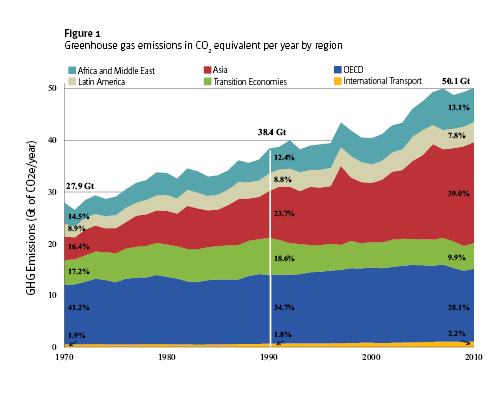 Furthermore, over 88% of the growth in GHG has occurred, as shown in Figure 1, in countries that were non-OECD countries in 1990s. Low- and middle-income countries are thus the most affected by climate change and central to achieving a reduction in GHG emissions. 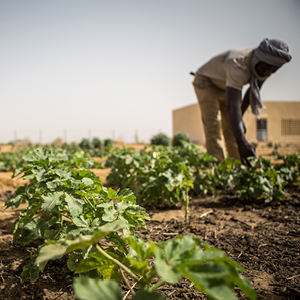 Agriculture is a key sector due to its dual role of being affected by and impacting climate change. The exact timing and magnitude of the impact of climate change on agricultural yields is though still a matter of debate. Estimates range from agricultural yield reductions of 50% by 2020 and revenue losses of 90% by 2100 in Africa’s most affected areas, to average maize yield losses in sub-Saharan Africa of 5% by 2050, relative to a ‘no climate change baseline’. Hence, the impact is sizable, especially for the poor, but will not necessarily derail the development process. While aid for environmental purposes rose substantially over the past three decades, aid for agriculture has nonetheless till the 2008 food crisis been sharply reduced. Traditional aid for rapid development alongside more flexible and robust policies may well be the best adaptation strategy, as a more educated population is likely to raise countries’ adaptive capabilities and coping strategies. Successfully addressing the global environmental challenges will moreover require new, flexible institutions and the transformation and repurposing of the existing ones to prevent rather than react to emergencies, such as food crises. Four such aid-related new institutional initiatives are: (1) Reducing Emissions from Deforestation and Forest Degradation (REDD++), compensating countries for reduced deforestation; (2) Clean Development Mechanism (CDM), seeking simultaneous emission reduction by allowing developed countries to purchase these in developing countries; (3) Global Environment Facility (GEF), linking grant funding with technical assistance; and (4) Green Climate Fund (GCF) facilitating financial flows from developed to developing countries. The lack of public policies creating demand for emission reduction, especially prior to the Paris CoP21 agreement, has so far limited these institution’s effectiveness. Besides, simple extrapolation of historical rates tends to misestimate future business-as-usual deforestation levels, as these do not incorporate the development state-related variation in a country's deforestation rate. Therefore, performance and measurement criteria are difficult to establish. Moreover, donors are willing to spend and unlikely to withdraw completely, but recipient countries are unwilling and without credible incentive to reform. Furthermore, inconsistent measures of emission levels, and unclear land tenure and use, create a disincentive to commit to adaptation strategies. Hence, without the public policy basis it remains still unclear whether these new initiatives could in practice help in catalysing climate change adaptation and emissions reduction in the long run. The aid architecture designed in the 1970s to assist poor people in low-income countries, when environmental issues were at most a distant concern, has contributed to the realization of the development objectives. However, it is not well suited to support the current aid and environmental challenges that extend beyond low-income countries. It requires restructuring and reforms along the lines of the five key policy recommendations, the implementation of complementary policies and future aid, to avoid the risk of substantially underperforming.